1. FRIENDSHIP, ALLIANCE AND PEACE BOTH BY LAND AND SEA IN PERPETUITY "LET THE LYCIANS OBSERVE THE POWER AND PRE-EMINENCE OF THE ROMANS AS IS PROPER IN ALL CIRCUMSTANCES"
4. IF ANYONE IS ARRESTED IMPORTING OR EXPORTING CONTRABAND GOODS, THEY ARE TO BE CHARGED TO THE HIGHEST APPROPRIATE MAGISTRATE OF THE TWO PARTIES. "WHAT IS SACRED BY THE LAW, THAT SHALL BE SACRED, OTHER GOODS SHALL NOT BE -"
5. "IF A ROMAN CITIZEN IS ACCUSED IN LYCIA FOR MURDER OR A CAPITAL CRIME, HE SHALL BE JUDGED IN ROMA ACCORDING TO HIS OWN LAWS, AND NOWHERE ELSE. BUT IF A LYCIAN CITIZEN IS ACCUSED, HE SHALL BE JUDGED BY HIS OWN LAWS AND NOWHERE ELSE"
6. "IF ANY ROMAN SHOULD BE ENGAGED IN A DISPUTE WITH A LYCIAN, LET HIM BE JUDGED IN LYCIA ACCORDING TO THE LAWS OF THE LYCIANS, AND NOWHERE ELSE, BUT IF A LYCIAN IS BROUGHT TO COURT BY A ROMAN, THE CASE SHALL BE HEARD BY WHATEVER MAGISTRATE THE DISPUTANTS AGREE TO APPROACH, SO THAT THE MATTER MAY BE SAFELY AND JUSTLY DEALT WITH"
8. 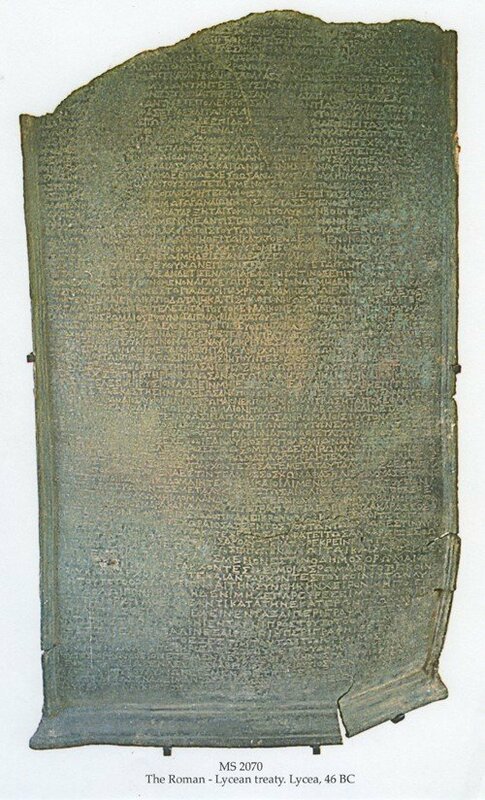 TERRITORIAL CLAUSES RELATING TO NAMED CITIES, VILLAGES, FORTS, HARBOURS AND TERRITORIES, WHICH HAVE BEEN RESTORED TO THE LYCIAN FEDERATION, ARE TO BELONG TO THEM, "JUST AS GAIUS CAESAR THE EMPEROR JUDGED AND THE SENATE PASSED A RESOLUTION AND JOINTLY CONFIRMED THIS. 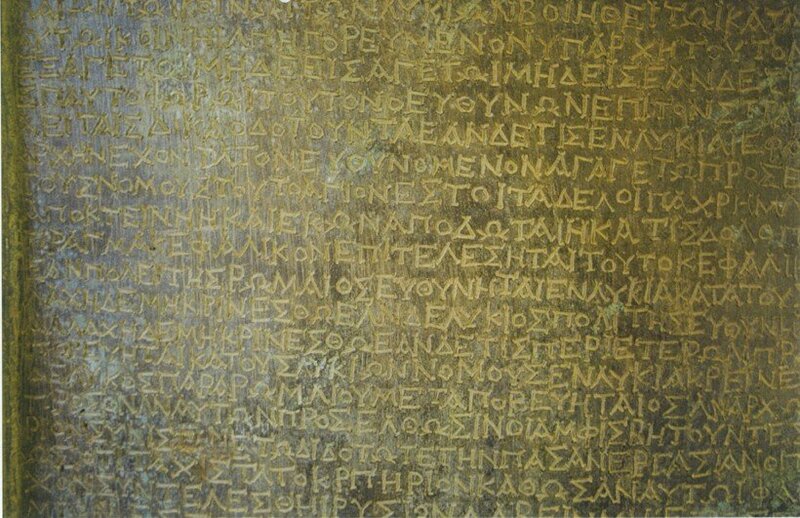 THIS IS SECURED AND GUARANTEED BY THE LAW OF CAESAR"
Description	 MS in Greek on bronze, Lycia, Turkey, 24 July 46 BC, 1 bronze plaque, 88x53 cm, single column (80x50 cm), 78 lines in Greek capitals, within a frame of double lines. Provenance	 1. Temple in the Forum in the capital of the Lycian Federation (46 BC-); 2. The Linzalone collection, New Jersey, U.S.A. and heirs (1925-1995); 3. Lennox Gallery, London, Nov 1995; 4. De-accessioned January 2017. Commentary	 The treaties between the Romans and their allies were the corner stones of the Roman Empire, and one of the main causes of their military success and stability over centuries. The present treaty is the only one of these that has survived in its original form. The present MS is one of the two official copies of the treaty. They were formally posted in a temple on the Forum in Roma and the Forum in the Lycian capital. The copy in Roma was destroyed in fires and wars as all the other copies posted there. Many of the cities, forts, harbours, etc. mentioned in clause 8, have previously been unknown. Gaius Julius Caesar (100-44 BC) after the victory over Pompeius and his forces at Pharsalus travelled through western Asia Minor en route to Egypt, receiving delegations from Greek cities and communities, who were anxious to make their peace with the new master of the Roman world. Clearly the Lycians were among these, and the new treaty rewarded their diplomacy. Published	 Papyrologica Florentina, vol. XXXV. 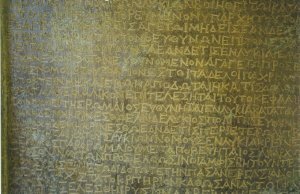 Rosario Pintaudi: Papyri Graecae Schøyen (PSchøyen I). Firenze, Edizioni Gonnelli, 2005 (Manuscripts in The Schøyen Collection V: Greek papyri, vol. I), pp. 163-243, by Stephen Mitchell.